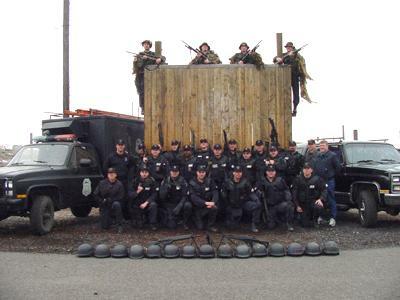 The Spokane Police Department SWAT team’s multi-million dollar para-military arsenal is Heckler and Koch (H&K) with the exception of handguns and marksmen rifles. 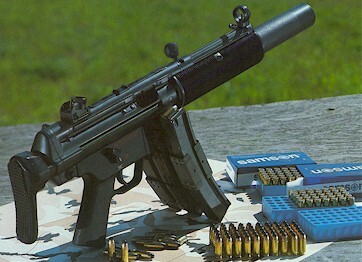 The SPD SWAT team maintains and deploys the H&K MP-5, 33, 53, and the G3 model rifles. Handguns are the Glock .40 caliber fitted with M-3 tactical lights, and the marksmen use custom rifles built off Remington 700 actions. The CART team (a chemical weapons unit) maintains and deploys all the specialty impact munitions and chemical agents utilizing both 37 mm and 40 mm launchers. Retired SPD SWAT team member Skip Pavlischak, who is an adjunct instructor for the H&K International Training Division, provides the SPD SWAT team with training and technical assistance. The SPD SWAT team also has the equipment necessary for all types of tactical missions. The equipment includes night vision devices, lighting systems, shields, bunkers, breaching tools, noise/flash diversions (NFDD), and other mission specific tools. The SPD SWAT team uses two dedicated marked police cars for “quick response” deployment of weapons and equipment during duty shifts by member working patrol. Two Chevy suburbans, retrofitted with extended running boards and handles are utilized for most tactical missions. The Team also has a separate equipment vehicle and recently acquired an Armored Personnel Carrier (APC). Recently Spokane’s KREM TV and KREM.COM reported on the increasing firepower of Spokane Police officers.Per KREM’s Kara Kostanich, 60 Spokane Police Department personnel–mostly members of SWAT and other specialized police groups–were using the Colt AR-15 assault rifle at the time of the March 29, 2007 broadcast. An additional 34 AR-15s had been ordered but had not yet arrived. Sgt. John Roys of the SPD claimed on-air that the rationale for the arms purchase is to be able to “defeat” the increasingly armed Spokane populace. The plan is for each patrol team to carry two AR-15 rifles. Given that at the time of the March 2007 KREM 2 broadcast, the 34 additional weapons were expected to arrive within two months, one can sleep better now knowing that your Spokane Police Department is now ready for battle with nearly 100 assault weapons.